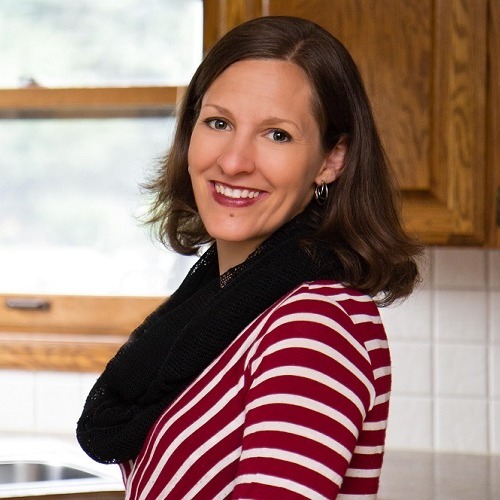 Katie Kimball is a blogger, former teacher, and mom of 4 kids who founded the Kids Cook Real Food eCourse. She started her online life at her blog, Kitchen Stewardship, where she helps families stay healthy without going crazy and has 8 published cookbooks. Katie wanted to create cooking classes for kids to help parents get a little help in the kitchen, build life skills, and hopefully even get some kids to eat vegetables. But through her work and research she realized that teaching kids to cook is the best way to show kids that they matter and can make a difference in the world. She believes if every child in America was taught to cook, we would smash statistics on childhood obesity, depression, behavior disorders and more. As a national voice of healthy kids cooking online and through television and print coverage (Fox 17 Grand Rapids, Fox 2 Detroit, First for Women magazine and more), Katie shares strategies for parents to inspire their kids to learn to cook, increase healthy foods (even for selective eaters), and build connection, confidence and creativity for the whole family, all around real food and cooking. Stop by her booth for an assessment of what your children could be expected to do in the kitchen a practical tips to get started right away! As Christian parents, you are called not only to build the faith in our kids, but also to build them into capable, independent human beings. It’s your duty to help our families be healthy, and God really does have a plan for that. When your kids are healthy in body AND know how to continue to be healthy as adults because they have the skills, they can better serve their own families and communities as Christ intended.Come learn from Katie Kimball, founder of the Kids Cook Real Food eCourse and a national voice of healthy kids cooking, and look forward to healthier, more calm mealtimes, independent kids, and grace flowing through your kitchen.You'll learn about:* Holy Eating: Infusing Faith into Mealtimes & God’s Plan for our Families Through Food (cool brain science!) * What do we Eat? Top 5 Easy, Healthy Foods (+ 2 Things Kids Should Never Eat) * 3-Step Process to Get Kids to Eat More Vegetables * The Bonus Secret – How Will Your Kids Buy Into All This??? This actionable workshop from Katie Kimball of Kids Cook Real Food will help you understand WHY it’s so vitally important to teach our kids to cook, beginning with the end in mind: what kind of adults do you want to raise?For independent, healthy, faithful, generous adults -- you'll want to start in the kitchen, where you truly can build all those qualities. Consider this your stress-free guide to cooking with kids!You'll learn:* how to have the right mindset for working with kids in the kitchen * how to motivate THEM to want to work with food * what skills kids can do at each age (including sharp knives and a special system to empower kids who can’t yet read) * 3-step system for teaching kids new skills * powerful examples of building connection, confidence and creativity through cookingYou'll be inspired to supercharge every moment you spend in the kitchen and upgrade your kids' skills to REAL cooking that will sustain them for the rest of their lives.